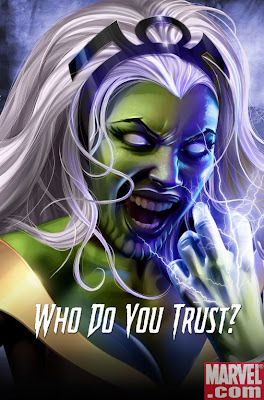 Marvel’s Secret Invasion Promo: Storm as Skrull? So, Marvel’s gearing up the hype machine for its latest on the way crossover world shattering event Secret Invasion where Mark Millar apparently hid skrulls in the Marvel Universe to pose as any character whose, er, character he wanted to assassinate. You can see a good number of the teases here. Among the possible heroes whose place may have been taken by shapechanging aliens are: Luke Cage (in full Power Man regalia), Spider-Woman, Wolverine, Hawkeye and Dark Phoenix (yeahbuwha?). Now they’ve thrown Storm into the mess. Try to avert your eyes if you can, dear reader, but I’m afraid there’s no escaping it. Smart Newsarama reader have already noted that it should read, “WHOM do you trust?” but that’s so beyond helpful at this point. Poor Marvel. Hell, I’m almost wishing Ororo was a skrull so they could redo the whole marriage thing and actually court for two years instead of shoving her and T’Challa together in a sales stunt. *Sigh* Well, there’s still something uglier than Skrull-Storm, and that’s M.O.D.O.K. Storm, courtesy of Marvel Adventures Avengers (which is a damn good read, even if it’s suffered a bit in the humor department since the departure of Jeff Parker).